Float in the lap of luxury or get dunked during a Utah river trip. Utah’s snow and mountain-biking terrain are world-famous, and rightly so. However, we’re also world-famous for another geographical blessing that gets a lot less local recognition: river running. The Beehive State has a near-unbelievable array of wild rivers in our mountainous high-desert location, from the slow and placid to white-wave waters packed with roaring, crashing rapids. Bob Skinner of Henefer, a professional river guide for 30 years, says that navigating the water was only one of his jobs. “I did a lot of cooking. Rafting clients eat like kings. We cook well for them,” he says. Choosing a rafting company can be overwhelming—there are five in Salt Lake City alone, plus more in southern and other areas of Utah as well as out-of-state firms that specialize in Utah waters. 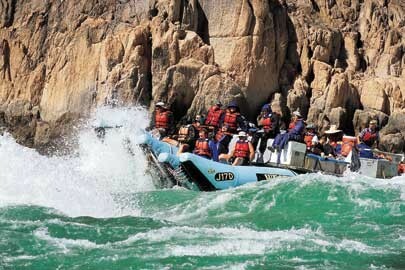 Some run multiple rivers, including unforgettable voyages along the Colorado River through the Grand Canyon. Skinner advises doing some research before choosing a company. “Get a good recommendation. Call around, ask people what rivers they’ve gone on. … It’s just kind of word of mouth. If you call a company, they should answer the phone and sound happy to do what they’re doing,” he says. The price is one sign of how popular rafting trips have become. It makes Skinner nostalgic. “Thirty years ago, that same trip was about, like, $500,” he says. But even at today’s prices, a rafting vacation is still a fairly economical choice. There are no real incidental expenses, no necessity to buy a snazzy wardrobe. “We recommend people wear water sandals or shoes that they don’t mind getting wet. Like other companies, we provide everyone with a life vest and a dry bag to keep personal effects and electronic devices from getting wet,” Merrill says. Aside from the Colorado River, you can choose from the Green, San Juan, Yampa and other big Utah rivers. Most companies have trip directors who will help you plan your river trip, from the calm, mild rapids of the Class 1 and 2 rivers all the way up to expert Class 4 and 5 rivers, which offer the most challenging rapids run commercially. Some trips even offer a chance to fish for your own dinner. For fishing novices, the guides will bait your hook and teach you how to cast and reel in your catch—and then clean it and cook it for you.